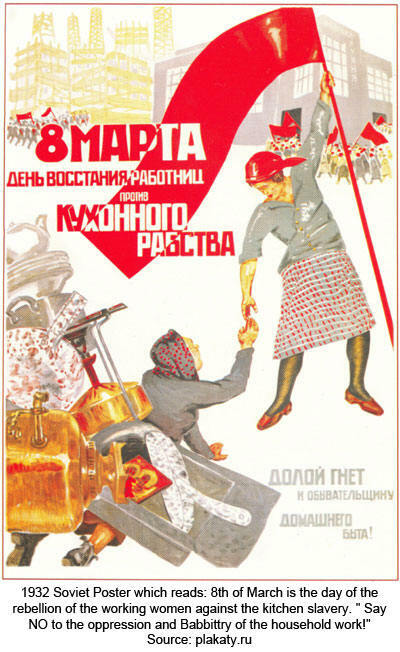 International Women's Day ( March 8) is a longtime Communist propaganda tool. What does it say when an official Soviet holiday is enshrined in our mainstream culture? Clearly, Communism isn't dead; it has just morphed into other forms like Feminism. It confirms Norman Dodd's famous claim that Ford Foundation President Rowan Gaither told him, in 1954, that the agenda was to "socially engineer" US life so that "that it can be comfortably merged with the Soviet Union" as part of banker-controlled world government. 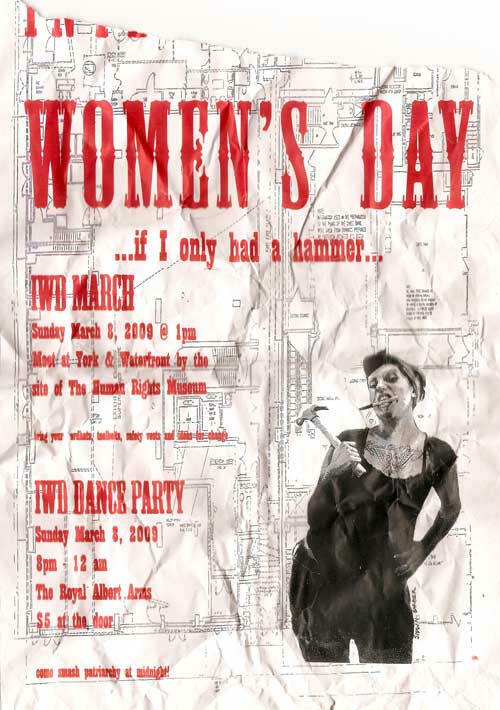 "Women's Day" pretends to celebrate women but the poster near my Winnipeg home shows an ugly, surly shrew brandishing a hammer. She looks demonically possessed. The caption reads, "if I only had a hammer.."
She'd what? Hit men over the head? Tear down society? Smash women who want husbands and children? This isn't far fetched. Under the dance notice, the poster actually says: "Come smash patriarchy at midnight!" Women participating in the march are asked to bring "your hardhats, tool belts, safety vests and ideas for change." Typically Communists celebrate women by redefining them out of existence, as males i.e. carpenters. They used the same tactic with Jews, Blacks and workers and harnessed these groups to their agenda. The ultimate goal is to concentrate all wealth and power in the Illuminati (Masonic) central banking cartel which is colonizing the whole world. The real meaning of "change the world" is the establishment of a totalitarian New World Order. International Women's Day is hate against women and society perpetrated by the traitorous banker colonial establishment, which includes most "feminist" politicians, educators and the mass media. Women who participate are dupes and "useful idiots." Communism is about divide and rule. International Women's Day was inaugurated in 1910 in Copenhagen by "The Socialist International" (i.e. Communists) to promote "women's rights." As the poster on the right indicates, it was celebrated in Soviet Russia. Women's Day is designed to make women feel oppressed. For example, a page of "gender facts" tells them that "women do 2/3 of the world's work but get only 10% of the world's income." Thus, western women, the most favored generation in history, get a chip on their shoulder vicariously. Thousands of events are planned around the world. For example, at the Unitarian Church in London Ont. an organization for Afghanistan women and girls "will honor and celebrate our local women with music, singing, dancing, and refreshments. All women and girls are welcome. Free event!" Sounds lesbian to me. In San Francisco, there will be a cocktail party and movie to highlight the plight of the women of Gaza. What about the men and boys of Afghanistan and Gaza? Don't they count? In the name of equality, these Communist dupes are practicing inequality. By breaking up families,they will leave Muslim women and girls more vulnerable than ever.